While B&O tuners and receivers are generally quite good, they rarely provide adequate results - or any reception at all - without some kind of an antenna. The purpose of this document is to give answers to most common problems and questions relating to radio reception. In this section, we will take a look at the various connector types you might find in B&O receivers, in roughly chronological order. This connector type was used extensively from '50s valve sets to the latter half of the '60s. Here you can see the antenna connectors of a Beomaster 900 from the 1960s. 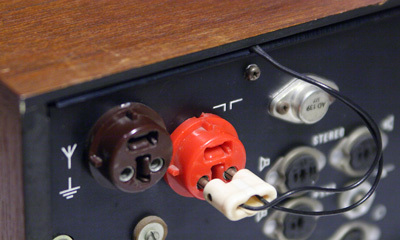 The brown connector is for AM reception (antenna and ground) while the red connector is for FM. 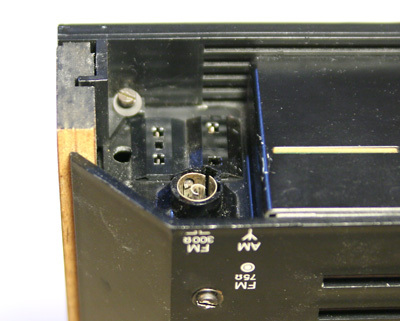 The built-in FM antenna of this Beomaster has wires coming out from under the case top, terminated to the original two-prong connector. 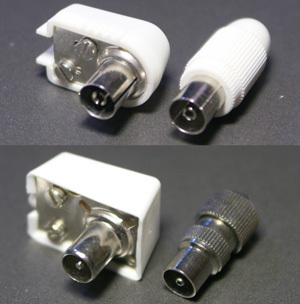 This connector cannot be sourced new anymore and is often missing, after having been used for an external antenna or simply stripped off and lost during transport. If you can't find one from some other collector's junk box, a couple of regular 4 mm banana plugs (picture below) can be used. Alternatively you can use spade shaped plugs in the rectangular sockets (these are just connected in parallel with the round sockets), but those plugs will be even harder to find. These connectors were introduced in the mid-'60s. 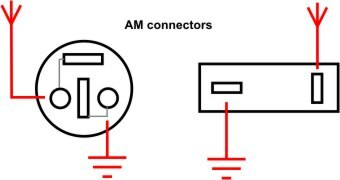 The official designation for the FM connector is DIN 45316 and the AM connector is DIN 45315. B&O used these connectors from late '60s to the end of AM availability. The FM connector was later joined by the round 75 ohm IEC connector (described later in this document), and the current products usually only have the round connector. The picture above shows the antenna sockets of a '70s Beomaster 2000. It has the full selection - a 300 ohm FM aerial connection, a 75 ohm IEC female FM connector, and the AM connector. On receivers with two FM connectors, you can freely choose the one that best suits your antenna. Here we have an original B&O "rabbit's ear" FM antenna from the '70s, with two adjustable telescopic whiskers, and a closeup of the balanced 300 ohm FM plug. Note that the FM plug has a plastic key in the middle - the AM plug, although looking similar at a first glance, doesn't have the key and one of the prongs is rotated 90 degrees, so the FM and AM plugs aren't interchangeable. The FM plug is symmetric and it doesn't matter which way it is inserted, but the AM plug only goes in the correct way to differentiate the aerial and ground contacts. Many Beomasters have a slot in the rear panel that accepts an antenna of this kind. Here you can see it installed on a Beomaster 4000. It is an FM-only receiver, so it only has the two FM connectors. This is the connector that is used in modern TV sets and radio receivers in Europe. The official designation is IEC 60169-2, but you may see it referred to as a Belling-Lee connector, IEC 169-2, a PAL connector, or simply as a TV aerial plug. The picture shows examples of angled and straight female IEC connectors (top row), and angled and straight male connectors (bottom row). In the next picture, you see the connector bay of a Beomaster 5000 from the mid-'80s. If you look closely, it reveals that you now need a female plug instead of male, opposite to the older IEC equipped receivers. The standard way of doing things changed around this time and continues like this to date - radio receivers have a male socket, while TV sets have a female socket. Depending on when your house was built or last renovated, the wall socket panel of a central antenna might correspond to this, or have some different arrangement so be alert when you buy or build an interconnect cable. Although it does no harm, you won't usually get a good radio signal if you connect your receiver to the TV outlet! 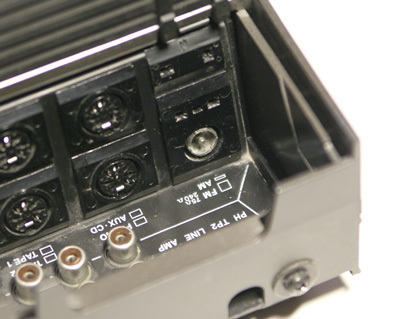 The stackable receivers like this Beomaster have the IEC socket in a quite tight space, so you will usually need an angled connector. Footnote: the impedance of this connector isn't actually matched to 75 ohms. This is not a big concern at FM frequencies, however. F connectors are another 75 ohm coaxial connector type. They have not been used in B&O radio receivers, but especially North American aerials and antenna installations might be terminated to one. Usually you can find adapters or adapter cables from F to IEC, or you could just snip the receiver end of the F connector cable off and replace it with a suitable IEC plug. 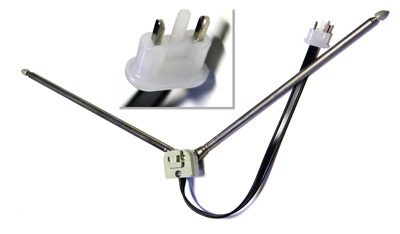 You will find F connectors in B&O satellite receiving equipment, though - both in standalone units such as the Beosat RX, or the built-in satellite receiver modules in some Beovision TV sets. Cables will be fitted exclusively with male F connectors (on the right in the image below), while the devices that the cables connect to, will have female F connectors (such as the one on the left). Male F connectors have a freely rotating hex sleeve that threads on the female connector, so they are very secure. If your house or apartment has a central antenna or your cable operator carries FM radio stations as well, it is usually best to simply use that. If your receiver has the 75 ohm IEC connector, all you need is a suitable interconnect cable. Note that on cable, the frequencies are usually different from when receiving the same stations directly off-the-air. However, if you don't have a central antenna connection or a factory made aerial for your receiver, we'll describe here a few simple FM antenna types you might try. In many cases, all you need is a single wire - length around a meter or two. Connect it to the center pole of the 75 ohm IEC connector, or one pole of the 300 ohm connector (try inserting the plug both ways to see which works the best). Even if this weren't enough for proper reception, it should pick up the strongest stations and you will at least find out if your receiver is working or not. Technically, this is similar to a "whip antenna" or a "rod antenna". A dipole antenna is the simplest antenna type that is somewhat directional. The FM connector symbol ("split T") you saw above on the connector panels actually depicts a dipole. Half-wave refers to the dimensioning of the antenna: the width of it is around half the wave length of the frequency you want to receive. In most countries the FM frequencies span from 88 to 108 MHz, and the middle of it corresponds to roughly 2.9 meters, so both legs of the dipole should be about 73 cm long. A half-wave dipole has close to 75 ohm impedance, so it is very easy to connect using 75 ohm coaxial cable to an IEC connector. One way to construct this antenna is to get a ready made IEC interconnect cable that fits your receiver. Then snip off the connector from the other end and connect two 73 cm wires to the cable, one to the outer sleeve and one to the inner conductor. Spread them out (but don't short circuit them at the connection to the cable) and your antenna is ready. Another, less optimal half-wave dipole can be constructed from twin lead speaker cable. Measure 73 cm from the end, and split it. Cut the other end of the cable to required length and connect it to a suitable IEC plug (one conductor to the sleeve, the other to the center prong). Alternatively you can connect it to the 300 ohm socket. As said before, a dipole is directional. The best reception will be perpendicular to the legs - try rotating it around as space and location allows and note the best position for the weakest stations you wish to receive. A folded dipole is a variation of the half-wave dipole. This time however, the impedance is 300 ohms, so it is more suitable for receivers that only have such a connection. This antenna can be constructed from 300 ohm twin cable - the flat kind you saw above in the rabbit's ear antenna. This time the conductors should form a loop (see picture). Take a half-wave (145 cm) length of the cable, strip the ends and connect the conductors together at each end. Now cut one of the conductors in the middle and connect another length of the same cable to it as shown. This is your feed cable, and you can make it as long as required. Connect the other end of it to the 300 ohm FM socket on your receiver. If none of these antenna types give proper reception, you will probably need to resort to an outdoor aerial. Another option might be to try an active FM antenna. These are outside the scope of this document - however, the connection problems and solutions remain the same. For example in Japan, the FM broadcast frequency range is lower (76-90 MHz). This corresponds to a longer wave length, and the dipoles need to be resized accordingly. A suitable length for a single quarter-wave leg is thus around 86 cm. In principle, you could use the same antenna constructs for AM and FM. However, the wave lengths on AM are much larger and a properly dimensioned dipole would be enormous! Most practical AM antennas will therefore be variations of the "long wire" construction, connected to the antenna socket on the receiver. The receiver will also have a ground connection for AM, which should optimally be connected to a good earthing connection. The diagrams above show how the AM connectors are wired, looking at the front (outside) of the socket. In the old days, most antenna instructions told you to hang an as long as possible wire outside, somewhere high between insulators, and then lead the antenna wire from it inside to your receiver. This can however be dangerous during thunderstorms, and in modern built areas an outside antenna might just bring in more interference along with the signal. Therefore you should first try the same thing inside. Connect a wire to the antenna socket and run it around the room. Try to stay far from computer equipment and electrical appliances that will create interference. As mentioned before, the best AM reception requires the ground connection as well. Traditionally this was connected to a central heating radiator or a water pipe, as they had a good galvanic connection to Mother Earth, either directly or through the electrical wiring of the house. However, nowadays you can't always trust it, as piping is often made at least partly from plastic. Grounding a faulty valve set like this could also create an electrical hazard, even outside your apartment! For these reasons, leave the AM ground disconnected if you are unsure. An excellent option for indoor AM reception is the B&O Active AM Antenna 10 - if you can find one, as it has been long discontinued! What are these "ohms" I see here? My multimeter just shows 0 or infinity. When discussing radio antennas, the ohmic value doesn't describe resistance. Instead, it stands for radio frequency impedance which you can't measure with a multimeter. This is a complex subject, but all you have to know in practice is that the impedance of the antenna, cable, connectors and the antenna input in the receiver need to match. However, unless the receiving conditions are very difficult, this isn't critical at all. You may mix & match for trial purposes, and if you are happy with the results, just forget about it. Where can I buy these connectors and cables? BeoWorld can't endorse any specific suppliers. Modern type connectors and cables can be readily found in stores and online shops that sell electronic components or AV equipment. For older plugs that are out of production, you'll need to search around. They are often seen in online auctions, a fellow collector might have a spare, or if your neighbourhood has a long running radio/TV repair shop, they might be able to help you. I can't source the correct plug. Can I just insert bare wires into the socket? Yes you can. However, use common sense and ask for advice if in doubt. Secure the wires with tape or something similar - you should resist the temptation of jamming matches, toothpicks or such into the socket. They might loosen the spring tension of the socket, and it might not work reliably with the right plug any more. I have an old valve radio, do these instructions still apply? Generally yes, and typically banana plugs can be used - however have the set checked for safety before this! Certain typical failures of older valve sets might allow hazardous voltages to reach the antenna connector, making them unsafe to touch. In particular, never try connecting your valve set to a central antenna wall outlet without prior advice on the subject. You might endanger equipment outside your flat, or even your neighbours! If this document didn't help you, you are welcome to post a question on the forum. Choose either "Vintage Products" for older kit, "The Workshop" for discussion beyond the back panel connector, or "General Forum" if you just can't decide.